PMC X-TAC ammunition is a great choice for long distance range training and target shooting. These new production 308 Win rounds are loaded into factory fresh brass cases that come boxer primed and can be re-loaded. 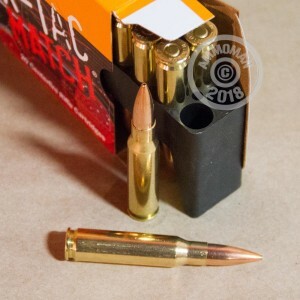 PMC loads Sierra MatchKing 168 grain Open Tip Match projectiles into these cases that leave the barrel around 2,700 feet per second. 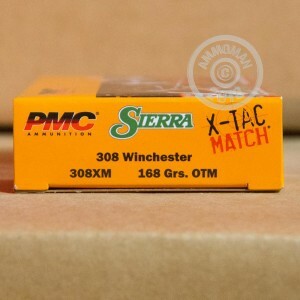 Sierra MatchKing OTM bullets have a reputation in the industry for being some of the most consistent and accurate projectiles available for the 308 caliber. These OTM bullets feature flat trajectories, high momentum delivery, and low sensitivity to cross winds, making them perfect for your precision 308. PMC was established in 1968 in order to supply the South Korean military with smalls arms munitions. Since then, PMC has earned a reputation for providing shooters with high quality products that are consistent and reliable. Thanks to their unique vertical integration, PMC is able to control the quality of the raw materials that they use to produce ammunition. Don't forget, at AmmoMan.com all orders over $99 will receive Free Shipping! So stock up on all your calibers and save!.